As companies compete in the e-business marketplace, they find that they must re-evaluate their business processes and applications so that their technology is not limited by time, space, organizational boundaries, or territorial borders. They must consider the time it takes to implement the solution as well as the resources (people, money, and time) they have at their disposal to successfully execute the solution. These challenges, coupled with the integration issues of existing systems and the pressure to deliver consistent high-quality service, present a significant undertaking when developing an e-business solution. 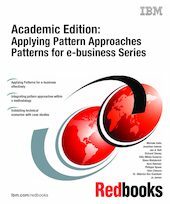 IBM Patterns for e-business provide a structured way of decomposing simple or complex requirements into a layered set of reusable architectures and designs. We discuss the key features and identify guidelines for each of these approaches. We document the alignment of these approaches within a context of a proven methodology, the IBM Global Services Method.